The best puppy class around! We not only train for a well mannered puppy we also focus on the importance of proper socialization for your puppy. This is a huge priority for us here at Conscious K9, getting your puppy off to the right start can make all the difference in the world and ensure you do not have problems with fear, reactivity, anxiety, aggression, etc. in the future. We help you understand what makes your puppy feel safe, build a good relationship, and teach you how to help them trust you as the person that will lead them into great situations. We help your pup properly get acquainted with people, kids, skateboards, wheelchairs, canes, walkers, elderly, and SO much more. Yes we also address everything from basic obedience, puppy biting, potty training, walking on leash, and much much more. These are small classes and fill up quickly, please call for class schedule and sign up. 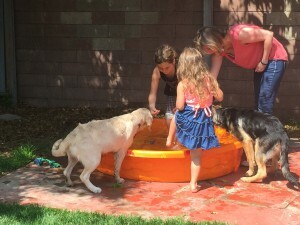 Our Group Classes focus not only on obedience but heavily on behavior as well. You will learn everything from how dogs learn, the importance of leadership, how to create a calm dog, to all of your basic obedience and more. Keeping our classes small ensures each person/dog gets the attention they need during class. We allow only 5 dogs in each class. They fill up very quickly. Please call for next available classes and to discuss what training is best for you and your dog. Our drop in classes are a mix of obedience, confidence building, impulse control and relationship building in a group setting. This is a really fun class for you and your dog without the pressure of having to be there every week while still accomplish your training goals. We run this class with a similar criteria each time. Please call to ensure available space and to determine if this class is suited for you and your dog. We do not allow anyone into class who has not first been evaluated.